Dutch photographer Patricia Nauta is especially interested in portraying people, by which she wants to capture a person’s passion, feelings and living situation. In her series Ontheemden (translated to English as: The Displaced) she portrays children who recently came to the Netherlands as refugees. The portraits are made within the particular period these children were awaiting their residence permit for the Netherlands. Nauta believes children have the ability to easily adapt to their surroundings, while at the same time showing great strength and vulnerability – something which inspires and touches her deeply. By using black-and-white photography, Nauta touches upon the essence of the individually portrayed child in its timeless simplicity, capturing the sincerity and the innocence in his or her eyes. 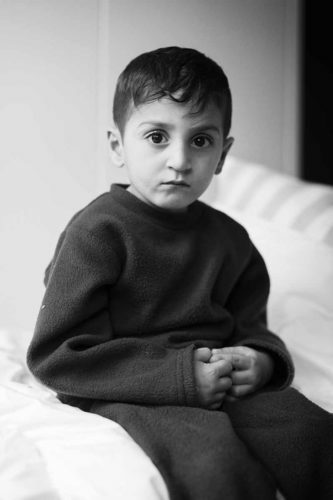 These children are more than just refugees, they are individuals with their own story to tell. Patricia Nauta (1963, NL) graduated from the Fotoacademie in Amsterdam in 2013 and works in Leiden.